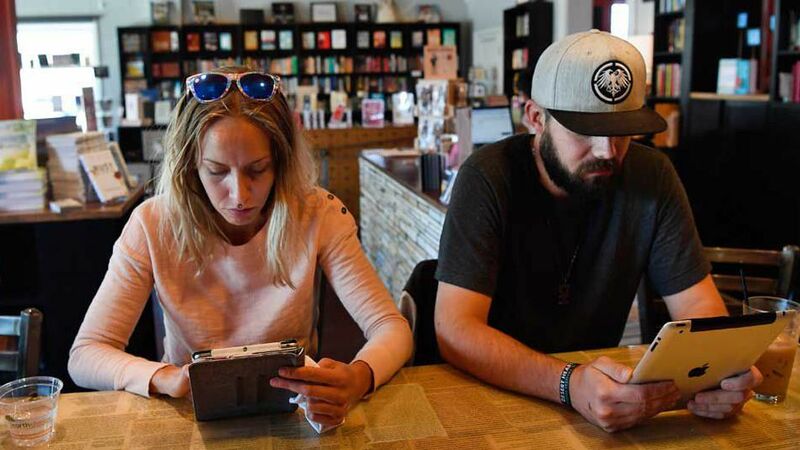 There is a growing trend of indie bookstores in the United Kingdom that are ditching wireless internet access. This is being done to combat showrooming, where people browse and find a better deal online. The absence of WIFI was first noticed in London and the bookstores participating are; Libreria Books, Tenderbooks, Word on the Water, Buchhandlung Walther König and Lutyens & Rubinstein. You may think it’s odd that bookstores do not want mobile phones being used and people staring at their screens, but it is a very London thing. There is a city tradition, from the private tranquil libraries of stately homes such as North London’s 17th-century estate Kenwood House in Hampstead Heath to the British Library’s Reading Room in King’s Cross — a place where the etiquette policy strongly discourages the presence of mobile phones entirely with tactfully placed signs. It’s in this tradition that these bookshops operate. Ha ha ha. England is TERRIBLE when it comes to wifi in public places. Back few years ago you had to pay for poor quality wifi in many hotels, in plenty of places is still not available or they charge you for it. Far behind continental Europe including Eastern Europe. Now many English cafes and pubs advertise themselves that they have “FREE WIFi” In my native Poland nobody does so as wifi in public places just is free – no point of labeling the shop window about this. I do not understand how this stops showrooming. Do phones not have data plans in London? With the advent of only e/i-print books ‘price comparison’ in an inevitability and creating a potential deterrent to shop any bookstore in this climate and where many bookshops struggle, (and even closed), is not conducive to giving readers/buyers ‘choice’ and will risk them voting with their feet and looking for alternative outlets. Bookshops need to have, (many do) an online presence where it can offer great competitive deals to attract purchase so counter losing on the swings and gaining on the roundabouts. Yes, for coverage it is not so good. But on the other hand it is better for the English folks who have become electrosensitive for Wi-Fi and other kinds of microwave radiation.